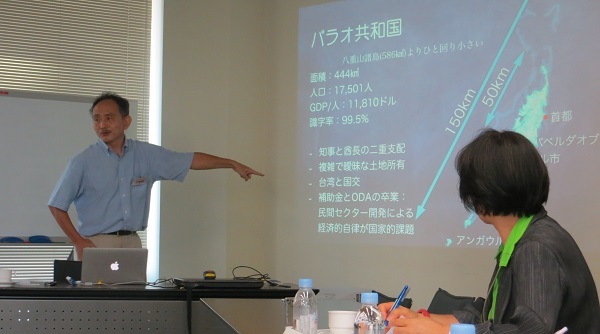 Mr. Yoshiki Hirabayashi, the Project Manager of Oriental Consultants Global, who conducted a one-month-preliminary-field-study in Palau, also attended the meeting. To begin the meeting, Mr. Hirabayashi presented findings of the field study conducted from April to May 2015, with his report titled "eco-tourism facilitation and tourism promotion in Palau". Click here for the presentation handout (in Japanese). After the presentation by Mr. Hirabayashi, the attendees exchanged their views on the topic. For example, it was pointed out that organizers and participants of this project should have common understanding of "eco-tourism" since the term has indistinct definitions. It was also emphasized that it is important to know the local residents' views on environmental protection and coordinate appropriate capacity building programs in order to create mechanisms to work with the locals as main actors. Ideas that arose during this study group meeting will be reflected on action plans to move the project forward.